Here we are at the final installment of "A Boot Story" - rounding out the series with my foul weather boot choices. Confession: I do have a few more weather-related boots (and possibly even some old pairs of Uggs - oh the shame), but they are more for walking the dog in the crappiest of conditions and felt their presence in this post would just exist to bring it down. So let's focus on my favorite boots to wear when precipitation is upon us, or just when it reaches temps of unacceptable ranges. 1. 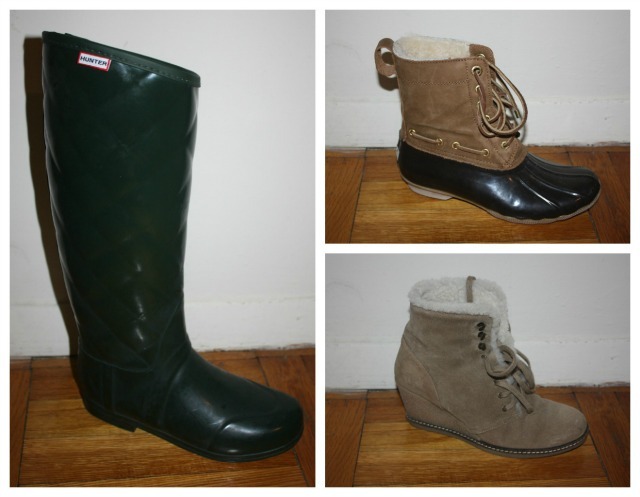 Hunter Regent Savoy Boot - How could I live in NYC and not own Wellies? It's like a rite of passage some would say. But truth be told, I am not the biggest fan of the standard style, as it tends to develop a chalky cast over it after a few wears because of the rubber material. This style does not chalk up at all! And I prefer the slightly slimmer cut and less rounded toe - tres rain chic. 2. Sperry Top Sider Shearwater Boot - Ahhhh, the infamous snow boot that many use as an opportunity to buy shoes that resemble yeti feet. I shudder at all those overly furry, fuzzy-wuzzy type snow boots. I was delighted to find a style that does a fine job of not overly distracting from my professional work attire during my dreaded walk to work- in the snow - up hill - both ways scenario that unfolds every winter. 3. J. Crew MacAlister Boot - My purpose in buying boots such as these was motivated by the frigid cold temps that do not produce snow but freeze my feet in pumps. Because I own so many skirts and dresses and am still a sucker for a good pump paired with, I need something to help me make it from the warmth (read - blazing hot pre-war building radiator heat) to the comfort of my midtown office (read - slightly chilly office building with a direct space heater pointed at my body all day). These fit the bill perfectly and look quite nice I might add. Think I may even pick myself up a different shade for this year - when you love something, you should own all the colors, right? It's written somewhere as a law I believe. So there you have it - my entire boot collection, save for a few pitiful pairs that I have had for over 10 years and only exist to be seen for a. dog walking b. armageddon. What is your boot collection like? Any pairs that you love that I should add to my closet? Though I am excited to share my boot collection - it pales in comparison to my excitement for my current GIVEAWAY! I am giving away a Julep holiday nail set - and get this - it is one of OPRAH's favorite things for 2012. I can hardly believe it myself. You know you want to win. Click here for all the details. Good Luck! My instagram is swimbeutiful I followed u! :) there's no doubt that you won't love Macs cremesheen glosses:) there shiny and not sticky! They are pigmented yet sheen! Great! Great! Great! These MacAlisters have got to be my favorite by far at this point - so glad J. Crew has brought them out again this year - I think I may need another color!